Let's pass over the metric stumble in the final line. Let's talk about scientific stumbles instead. Purple is not in the rainbow. "Purple" is what happens when you mix red and blue, and that can't happen in a rainbow because red and blue are on opposite sides. When you break up white light with water or a prism, the colors are organized by wavelength, and while red is the longest wavelength of visible light, blue is on the short end. In a rainbow, we get to see orange between red and yellow, and we get to see green between yellow and blue. And on the far side of blue, we get to see violet--the shortest wavelength human eyes can detect. At this point (if not much earlier), some people will probably roll their eyes and state: "You say violet, I say purple; let's call the whole thing off." I'll simply answer that with links to Wikipedia and Quora, so I can go on to the other aspect of the rainbow song that drives me bananas: the colors are out of order. 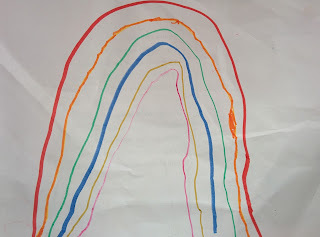 Was this entire post an excuse to post my kid's artwork online? WAS IT? I really couldn't say. Now, I am wholly in favor of free artistic expression. We've been reading Eric Carle's The Artist Who Painted A Blue Horse and I would never in a million years tell my kid she drew something "wrong." Still, would there be any harm in amending the song to reflect reality? Hey, maybe I can fix the meter while I'm at it. A rainbow's such a lovely sight. I hereby release these lyrics into the public domain. Go ahead and use them in all the schools and playgroups. I ask no royalties, no attribution--only the dissemination of accurate knowledge about optics to our impressionable youth. N.B. "What about indigo?" demands the righteously indignant reader. "If you're going to be pedantic about purple and violet, how dare you leave one of Newton's seven canonical colors out of your revisionist lyrics?" Dear Righteous Reader, at first this troubled me too, but it didn't trouble me quite as much as the nagging feeling that I've never been able to see indigo in the rainbow anyway. A bit of research revealed that I'm not the only one. There's a nice 1972 paper in the American Journal of Physics called "Why Did Newton See Indigo in the Spectrum?" and the argument against indigo is summarized cogently in this 2015 article at the National Post. Fascinating! I had no idea that violet and purple were regarded as different. Red, orange, yellow, green, blue, purple. The part of my brain that adheres to a descriptivist approach to language does consider the purple/violet dichotomy a bit silly. On the other hand, I really like having words that mean specific things! 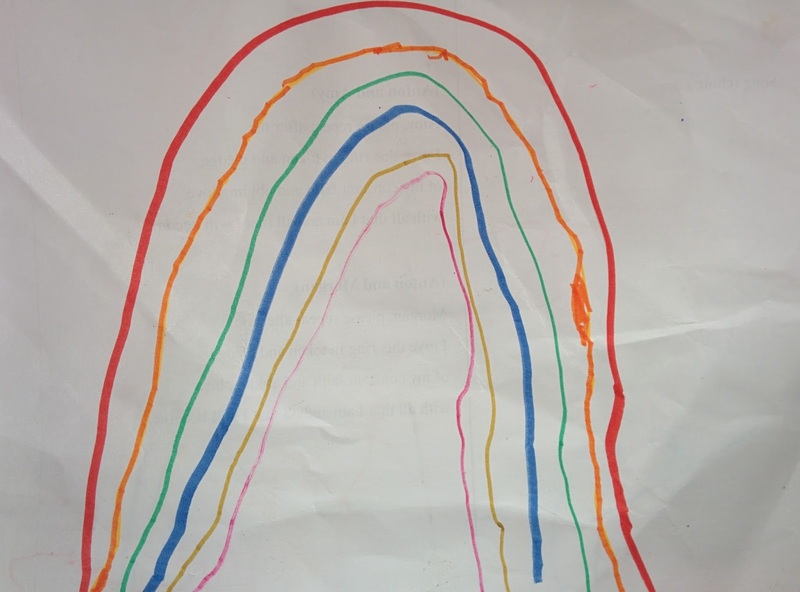 Does Megan's rainbow song have a catchy tune? The tune isn't too bad, I guess. I wasn't able to find it online. The tune is also "Twinkle, Twinkle, Little Star." I learned it in kindergarten or thereabouts; I always thought it was a staple of childhood, but apparently not! God made the colors, bright bright bright! My friend Charles shared this even more bizarre rainbow song. I was also unaware of the violet/purple distinction, but I agree that it's nice to have words that mean specific things. But this post prompted me to try to answer a nagging question that I've never found the answer to: why does violet *look* purple? As in, when people try to match a spectral color with a mix of red/green/blue, why does violet get a mix of red and blue, as shown in this image? My first guess was that red cones have a second region of sensitivity in the blue/violet range, but wikipedia doesn't seem to think that's the case. Also, color vision is weird. One of the violet/purple discussions I came across had a link to this illusion. Oh ho, the plot thickens! Thank you for bringing supernumerary rings into play, and for the super-freaky color illusion.